Join littlewhitey's Steam group by clicking here. Today I installed SA-MP on my san andreas copy and wanted to play some multiplayer, Once I open a server the game crashes and gives me an "exception error occured"
Singleplayer works fine, tried compatibility and DEP, didn't work. I don't know if this is the correct section to post such things, but I need help. Problems or successes, they all are the results of our own actions. Karma. The philosophy of action is that no one else is the giver of peace or happiness. One's own karma, one's own actions are responsible to come to bring either happiness or success or whatever. Can you show us the log of the error please? @myle after I close the log I receive an adress memory error. > Have you tried running it as admin after setting the compatibility mode? Have you tried running it as admin after setting the compatibility mode? I rather not perform this action as it will take me time and I am limited to one hour per day when staying on computer, also I don't think it will affect anything because I installed GTASA and SAMP at the same day. without downloading any other mods. from that point whenever I connect to a server the splashscreen appears then crashes, without showing me the loading bar or water around. these are some additional info concerning the issue. Not meaning to be rude but bump! Did not work. I tried MTA:SA and did not work either, giving me a similar adress crash error. is there something I need to download like c++ or .net framework? 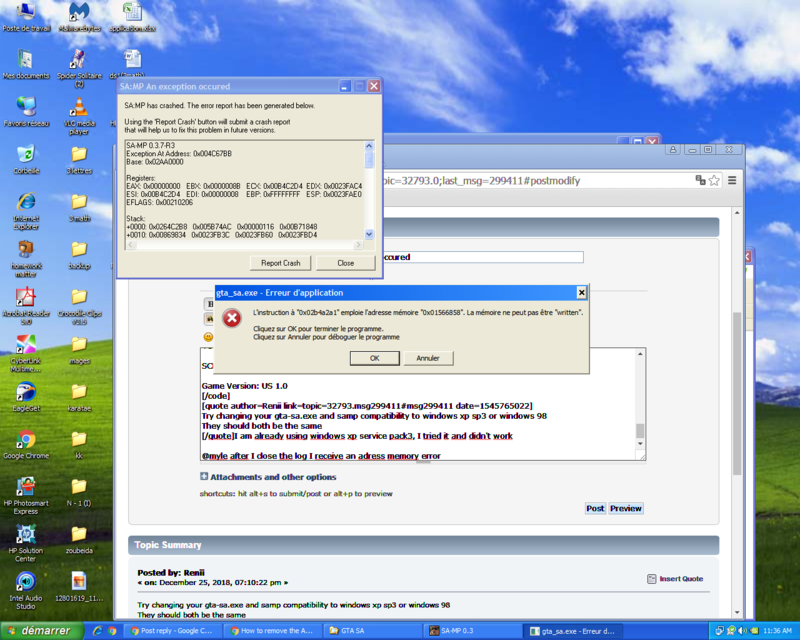 and is there "run as administrator" option in windows xp sp3? There should be a "run as admin" button, no? It's not there when you right click? As far as I remember it is not there, I am using winXP.